Last week, the spotlight was on the biggest shockers in the American League. Now, the Senior Circuit takes center stage. Here are the top 3 most surprising players in the National League. 1. Carlos Beltran: Who would have thought that a 35-year-old switch hitter would be in the top 5 in homers and anchoring a lineup? Probably no one. That's why Beltran is a shocker. Well past his glory years, he is playing the way he did during his first tour of duty in the NL Central with the Houston Astros. Cardinals fans worried about who would carry the power load with the departure of Albert Pujols, and Beltran has come through, putting up similar power numbers to Pujols this year. 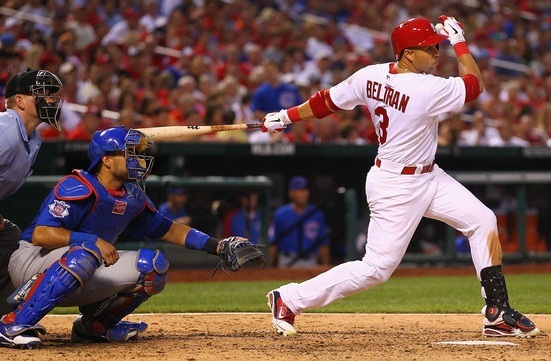 Beltran's season down memory lane has been a pleasant shock for St. Louis, and his continued production will be huge for their postseason hopes. 2. R.A. Dickey: If anyone would have said at the start of the season that R.A. Dickey would have more wins than Stephen Strasburg or Cole Hamels, more strikeouts than Yovani Gallardo or Tim Lincecum, and a lower earned run average than Clayton Kershaw or Matt Cain -- people would have called them crazy. Even Mets fans can't believe that they have a Cy Young contender whose name isn't Johan Santana. Dickey has had a magical season, riding his knuckleball all the way to a top 5 spot in wins, strikeouts, ERA and WHIP. He is proving that you don't need a 95 mph fastball to dominate major league hitters. 3. A.J. Burnett: When the Pirates acquired Burnett from the Yankees in the offseason, no one really knew what they were getting. Everyone knew Burnett had nasty stuff, but in three seasons with New York, he was plagued by inconsistency. However, since joining Pittsburgh, Burnett appears to be a new man. Anchoring the Pirates staff, he is in the top 5 in wins. Burnett has been the ace of a young pitching staff that needed a steady presence in their rotation to set the tone for the rest of the group. Along with a handful of players, there are a few teams in the NL that have shocked the world as well. 1. Pittsburgh Pirates: Simply put, the Pirates have gone from zeros to heroes. The team that year in and year out had been the doormat of the NL Central is seriously competing for a wild card spot this season. Led by the bat of All-Star outfielder Andrew McCutchen, the Pirates are making the city of Pittsburgh focus on baseball again. As a team, Pittsburgh is not putting up eye popping numbers. They are winning by grinding out the tough games and coming through with the clutch hits. At this point, with nothing to lose, the Pirates look to be an October shocker. 2. Washington Nationals: The Nationals have been under the national spotlight the entire season, but not solely because of winning. Having two phenoms, one a pitching prodigy and one a teenage stud, will bring all eyes on any team. But Stephen Strasburg and Bryce Harper aside, the Nationals have quietly assembled one of the best rotations in the majors. The staff as a whole ranks in the top 5 in ERA, quality starts, WHIP, and batting average against. They have three pitchers in the top 10 in the NL in ERA, two in the top 10 in wins, and two in the top 10 in strikeouts. They say that pitching and defense wins championships, so look for the Nationals to continue to turn heads -- even without Strasburg. 3. Miami Marlins: Brand new ballpark. Brand new jerseys. Spending spree to bring in some household names to bolster the roster. Last place in the NL East. The Marlins looked to have everything in place for a winning season, but something went terribly wrong along the way. They had to learn the hard way that money doesn't always buy championships, style doesn't get wins, and games are not played on paper. If that were the case, they would be in the race for the East right now. But when a team is ranked in the twenties in almost every major category, they're not going to be much of a factor in many October races. To put it mildly, this season has been an utter disaster for Miami. New name, new jersey, same results. In addition to the players and teams surprising, there is one major storyline that may also shock a lot of people. Melky Cabrera will most likely be the NL Batting Champion. Yes, the same guy who will miss the remainder of the season due to a 50-game suspension for testing positive for testosterone. How? Because there is no rule that states if a player is suspended for failing a drug test, he becomes ineligible to win an award if he qualifies for it. So unless Andrew McCutchen or Buster Posey get extremely hot this month and manage to surpass him, one of the most controversial headlines of the 2012 season will be Cabrera winning the batting title. September is shaping up to be a great month for the National League. And with all the headlines and players to watch out for, no baseball fan should be disappointed at season's end. Thank goodness for Beltran. He's kept my Cardinals in the playoff race. I don't think anyone could have predicted the Nationals would be this good this soon. They may win it all.